Suresh Prabhu on the priority being given to safety and the need for more funds for railways to move ahead. After the first Union Budget where railway finances were merged with the main one for the government, Railway Minister Suresh Prabhu spoke to the media. An excerpt. Your immediate take on the Budget? 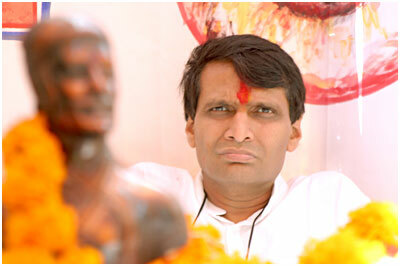 For the first time in the railways’ history, a Rs 1 lakh crore safety fund has been announced. That was the exact amount we have given to the finance ministry. We are focussing on issues on safety and station development. In the coming week, our ministry will invite tenders for development of 23 new stations. Focus has been provided for cleanliness. We have also launched a ‘41K’ mission, targeting savings of Rs 41,000 crore on the energy bill by 2025. We will also convert 500 stations into being differently abled-friendly. We have also laid a map to come up with 1,000 Mw of solar energy units. All the trains announced in the earlier Budget will be coming in the next few months. Gross budgetary support for you this year is Rs 55,000 crore. You will have to find the rest of the money. How are you going about it? Capital expenditure in the Budget Estimate is Rs 1,31,000 crore. We have to look for extra-budgetary resources. Since, the finance minister has only announced the capex plan, it is the duty of the finance ministry to also help us find that money. Any debt by a body like the railways is a debt of the government. We are also encouraging joint ventures with state governments. Non-NDA (ruled by opposition parties) states like Karnataka and Kerala have shown interest in this. On the safety fund, we are in talks with even foreign countries like Japan to know about the best global practices. Is declining freight traffic a concern? There is huge competition coming to the railways, not only in India but globally. Roads are completely privatised and there is competition from airlines. We have certain public service obligations as well. Hence, to look into rates and its revision, we are already creating a rail development authority. A Cabinet note is being floated. The depreciation reserve fund for maintenance has more than halved this year. How will the railways manage this with the increased focus on safety? Normally, the money going into social obligations should be reimbursed. We have a social obligation of at least Rs 30,000 crore. How this will be reimbursed should be looked into. With the merger of railways finances, we will not have to pay the dividend any more.